The answer to the "When opportunities arise around the house, which lens do you grab?" question for me is often whichever lens(es) I happen to be evaluating at the time. Some lenses are more easily pressed into general purpose use than others, largely due the focal length(s). Fortunately, 35mm focal length-containing lenses have been very popular lately and that focal length is great for general purpose use. 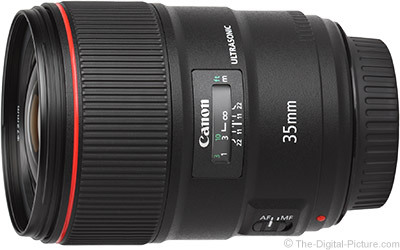 Especially great was when I was putting the Canon EF 35mm f/1.4L II USM Lens through its evaluation. Not only does this lens have the right focal length, but it also has a wide aperture, ideal for those around-the-house needs and often ready to capture high quality images without any additional lighting needed. That this lens has such great image quality at that f/1.4 max aperture is especially great. On this day, Brittany came home tired and took a moment to relax with the dog that is of course tired and relaxing most of the time. My currently-mounted lens was the 35 L II and it allowed me to snap a few cute pictures using only ambient window light. The other day, I looked over a large, steep, grassy clearing on our property. I quickly noticed a round orange object approximately 400' below. The bright color caught my attention, the round shape caused me the think it was a pumpkin and I later hiked down to confirm my guess. What I found was a medium-large pumpkin with deep bear teeth marks in it. Upon my return to the house, the girls informed me that the pumpkin was from our deck. The bear had carried the pumpkin away and likely, at some point, put it down, only to have it roll hundreds of feet down the hill. While the bear story is one for our memories, the fact that orange stands out so much is the lesson for today. Orange is a fall color and a primary source of that orange comes in the form of pumpkins. It is quite likely that one will show up at your house in the fall and if not, a neighbor likely has one that you could borrow. Or, take the family to the farm or market, photograph your people there and then bring home some color to work with. At home, spend some more time getting creative with your color source, increasing the color orange in your portfolio. Then, print your own fall decoration for next year, perhaps in the form of a metal print (love these). This simple image was captured in the shade of our front porch. I explored various angles on the subject, trying to consume the entire frame with it. This angle seemed to work nicely. After you have your orange, explore the yellows and other colors available in the other fall favorite, gourds!